Well that was quick. 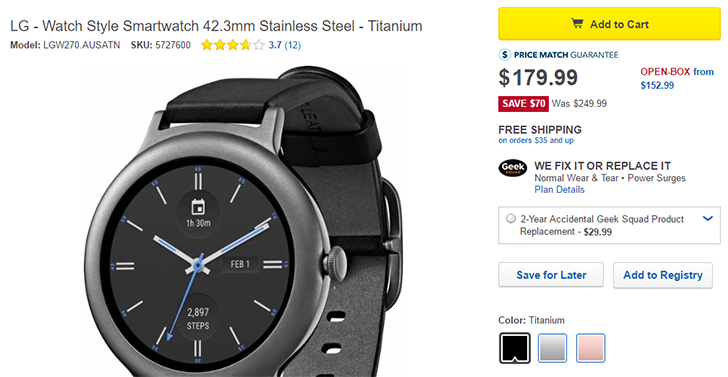 Just a month after the LG Watch Style went on sale, it's already being heavily marked down. Now you can get all colors of the LG Watch Style for just $179.99 - between $70 and $100 off the original price (depending on the model). If you need a refresher, the Watch Style was launched alongside the bulkier (and more expensive) Watch Sport. Although it is far thinner than the Sport, it lacks a heart rate sensor, NFC for Android Pay, GPS, and LTE connectivity. To reach that thinness, LG also reduced the battery capacity to 240mAh, which barely lasted through a day in our review. If you still want to grab one, you can do so from Best Buy at the link below. The LG Watch Style is still on sale at Best Buy, but now B&H is also selling all three models for $179.99. You can find them at the source link below.